I think all the images and edits are great. But the final version (Queen of Hearts!) is a knock-out. Very imaginative and striking. Great work. What a brilliant idea – the Queen of Hearts! So much work! I like this very original edit, but my favourite is your week 3 interpretation. Thanks so much 🙂 Yes it was a lot of work but it really does help to practice ideas and experiment! Week 3 was actually quite exciting to pull together using several different programmes 🙂 I had the ideas imprinted on my mind and I’ve loved the challenge of bringing them to life! Love the playing card idea. It works really effectively. Thanks Laura 🙂 I really did have fun with this! Thanks so much Scott 🙂 It’s been a great and challenging month! Thank you Jude!! Leaving some space maybe something else that I can look at for review month in April 🙂 I guess I am just about the Queen of Butterflies! I’d like to see what you CAN do with a landscape. 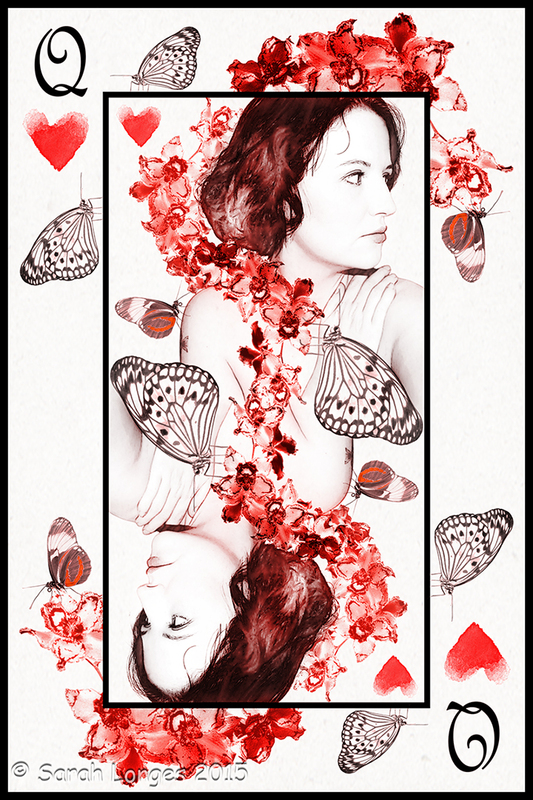 Well done Sarah, I love the framing in this one and also it is like a playing card – (queen of hearts?) so it has my vote! You’ve really saved the best for last! Beautiful. Amazing! So creative! And you are stunning! Thanks hun! I look better in my artwork 😉 Really loved doing this one, adding the butterflies and orchids and getting it all to work together! It really is stunning. And you’re welcome! I really like the playing card, it works so well. Thanks so much Ben 🙂 It was a lot of fun! Thanks so much Sue! I’m rather putting myself under pressure to keep up the standard now 😉 Yes, lots of passion went into this one and I was so thrilled with how it turned out! Stunning, stunning, stunning. Did I mention stunning work. I just love what you have done with it. Your work is well – stunning. Week 4 is brilliant – I love the way all the elements work together to produce such a unique work! Lol 😉 Glad to hear it my friend! These are all well done! The Queen reigns! Thank you so much 🙂 It was a really great month with this image! Oh, Queen of Hearts. Beautiful edit, very artistic and consistent throughout the month. I enjoyed it very much. I absolutely love what you did here – Simply inspired and so creative! Thanks so much Robyn 🙂 When I first started my blog as a 365 challenge it had me revisiting so much of what I had done and learnt at college. I’ve created a few montages that were based upon old oil paintings of mine and it can be really interesting to look back on older works and discovering things about yourself and the image that you hadn’t realised at the time. We can learn from ourselves at much as from others! Thats exactly what I did too Sarah, after my studies 😃 It was good to have a project after such intense ‘doing’… and missing my study buddies. I agree… Looking back at our work is always beneficial.